The book is written by Prof. Dr. Konrad Etschberger, former Director from Ixxat Automation (Weingarten, Germany) .The German version of the book is available in several editions. The English version, which is described here, was published in 2001. The book gives a deep insight into the CAN technology. Beginning with basics about data communication in the field domain, it continues with description of the two lowest ISO/OSI layers covered by CAN. Network topology, physical signaling, transmission media and bus access as well as the related standards are to find in the physical layer section. CAN data link layer chapter describes and illustrates possible CAN frames as well as the error detection, error handling and fault confinement mechanisms. Also the time-triggered communication is a mentioned issue. Although the chapter about the CAN protocol controllers and the CAN transceiver chips provides descriptions about some older semiconductors, the basic principles are well explained. The higher-layer protocol (HLP) section gives a generic insight into the CAL (CAN Application Layer), which is the predecessor of CANopen, but still used by some applications. The CANopen chapter provides the related communication and protocol principles and gives an example of a CANopen I/O device implementation. 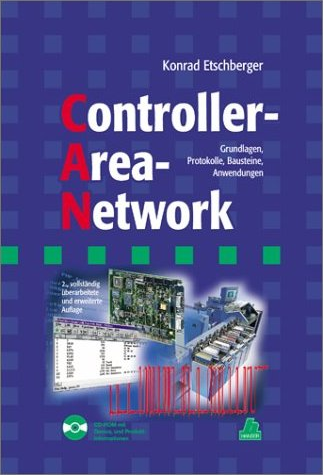 The book mentions only few CANopen device profiles (e.g. CiA 401 for I/Os and CiA 402 for drives and motion control). Currently much more CANopen device and application profiles are available from CAN in Automation. Also depicted in the book are DeviceNet, J1939 and TTCAN HLPs. The book ends with the chapter about implementation and system aspects. An example implementation is described using CAN cards and tools from Ixxat.